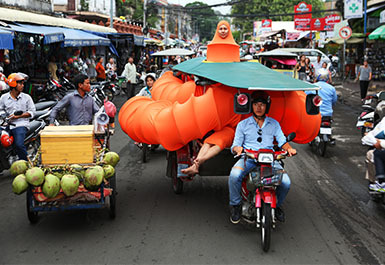 Asian artists have made decisive contributions to the development of global contemporary art, often by drawing on local concerns and traditional forms, philosophies and techniques. The Gallery's Contemporary Asian art collection is among the most extensive of its kind in the world, comprising over 1000 works from the late 1960s to the present which shed light on modern historical developments, current environments of social change and evolving models of artistic production. 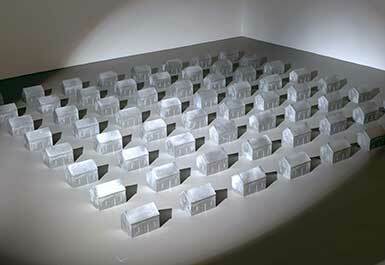 The Gallery acquires the work of leading artists from all parts of Asia and the Asian diaspora. Contemporary Asian holdings have been shaped by the Asia Pacific Triennial of Contemporary Art since 1993, including the APT's commissioning and collecting agenda which keeps the collection dynamic and up to date. Significant moments in the twentieth and twenty-first century Avant-garde are represented in the Collection by works such as Xu Bing's A book from the sky 1987–91, Nam June Paik's Global groove 1973 and TV Cello 2000, and in works by Yayoi Kusama, Lee Ufan and Ai Weiwei. The Gallery's historical Asian art highlights significant artistic developments across the region from the Neolithic period to the twentieth century, exploring diverse media, philosophies and techniques through painting, printmaking, sculpture, ceramics, textiles, metalware, lacquerware, photography and furniture. It draws attention to the importance of cultural exchange in the continuing development of Asia's aesthetic traditions, and contextualises the Gallery's contemporary Asian collection. 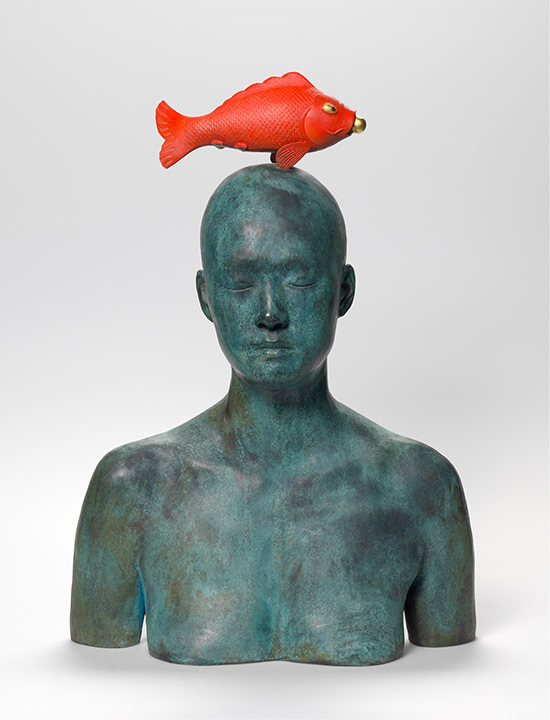 Ah Xian, China/Australia b.1960 / Metaphysica: Red Fish 2007 / Bronze, brass and oil paint / Purchased 2009 with funds from Tim Fairfax, AM, through the Queensland Art Gallery Foundation / Collection: Queensland Art Gallery / © The artist. Bizen Kilns, Japan c.1574-1602 (Azuchi-Momoyama Period) / Narrow-necked jar with lugs (tsubo) / Stoneware, coil built with natural ash glaze / Purchased 1994 with funds from Idemitsu Kosan Co., Ltd through the Queensland Art Gallery Foundation / Collection: Queensland Art Gallery. 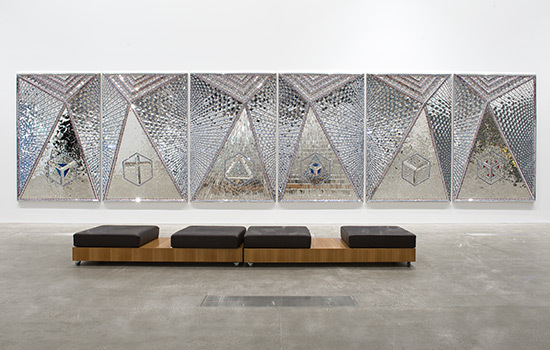 Monir Shahroudy Farmanfarmaian, Iran b.1924 / Lightning for Neda 2009 / Mirror mosaic, reverse-glass painting, plaster on wood / The artist dedicates this work to the loving memory of her late husband Dr Abolbashar Farmanfarmaian. Purchased 2009. Queensland Art Gallery Foundation / Collection: Queensland Art Gallery / © The artist. Asia's ceramic traditions are among the world's earliest and most influential. Forming an introduction to these is a group of Neolithic jars from Japan's Jōmon (3000–2000BCE) and Yayoi (400–300BCE) cultures. A group of two kuan (storage jars) and one amphora from China's Neolithic Yangshao culture (3500–3000BCE) complement this collection, allowing for dialogue regarding the development of ceramics in Asia. Broader holdings of Chinese ceramics mark important artistic periods and styles, including Tang dynasty (618–907) burial ware, celadon from the Yuan (1279–1368) and Ming (1368–1644) dynasties, blue and white wares from the Kangxi period (1662–1722) and a selection of porcelain including imperial works from the Qing dynasty (1644–1912). 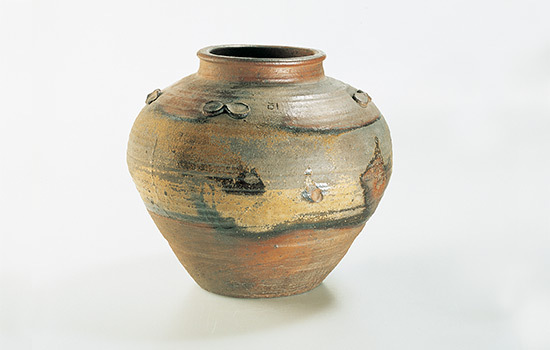 A group of tsubo (lidless jars) from Japan's Six Old Kilns (the Tokoname, Seto, Shigaraki, Tamba, Bizen and Echizen kilns), dating from the Muromachi (1333–1573) and Azuchi–Momoyama (1573–1603) periods represent some of the formative ceramic traditions in Japan as well as engaging with the Japanese tea ceremony and Zen aesthetic ideals. Works by Zen practitioners, such as ceramics by the Buddhist nun Otagaki Rengetsu (1791–1875) and calligraphy and ink paintings on scrolls by Gempo Yamamoto (1866–1961), Shoun (Gempo Sohan) (1848–1922) and Deiryu (Sojun Kanshu) (1895–1954) further illustrate the importance of religious belief in Japanese artistic tradition. A small collection of Imari porcelain and Satsuma ware conveys the importance of export ware and exchange with Europe in the nineteenth and early twentieth centuries. Philosophy and poetry have played decisive roles in the development of many Asian artistic traditions, and in particular, those of Japanese painting. A superb pair of Japanese screens attributed to the Hasegawa School, active in the Edo period (1600–1868), and a pair by Tosa Mitsuatsu (active 1734–64) depicting scenes from the influential literary text Genji Monogatari (Tale of Genji) exhibit the significance of philosophical and poetic ideals. Further examples of Japanese screens represent some of the major painting schools and the influence of neighbouring artistic traditions, as in Kano Yasunobu's (1613–85) Birds and flowers of the four seasons and the dramatic ink landscapes featuring the Chinese poet–scholars Li Bai and Lin Bu by Unkoku Toeki (1591–1644). The collection has extensive holdings of Japanese prints, in particular the popular form known as Ukiyo-e, or 'pictures of the floating world', which developed during the late seventeenth-century Edo period. The Gallery holds iconic works by leading exponents of this form, such as Ichiryusai Hiroshige (1797–1858), that demonstrate the skilful layering of introduced European methods of representation — such as perspective — with traditional visual language, including the expressive use of line. Other works feature the popular themes of beautiful women (bijinga) and the theatre by early masters such as Kitagawa Utamaro (1753–1806) and a significant collection of the later masters Toyohara Chikanobu (1838–1912), Taiso Yoshitoshi (1839–1892) and the Utagawa school. A more recent history of printmaking in Japan is told through examples of shin hanga (new prints) and sosaku hanga (creative prints) from of the 1930s to the 1950s, as well as diverse styles by printmakers from the second half of the twentieth century. The Gallery has recently broadened its focus to include works from South and Southeast Asia. Recent acquisitions have included Orissan and Later Chola period (c.860–1279CE) bronze sculpture, and a major Nepalese nineteenth century tantric painting, demonstrating the central role of religious art in the region. Indian miniature paintings convey the splendour of Mughal and Rajput courts in the eighteenth and nineteenth centuries, as well as contextualising to the Gallery's strong holdings of contemporary miniature painting. Other recent acquisitions include intricate weaponry from Indonesia and Malaysia, as well as textiles from Indonesia and Cambodia. Fascinating collections of historic photography trace the emergence of new ways of viewing and documenting Asian societies and cultures. These include albums of images of India and the Himalayas collected by a travelling English theatre company in 1899–1900; works by some of the first photographers to document Japan in the late 1800s; delicate Japanese ambrotypes; and colonial-era images of India, Sri Lanka and Southeast Asia. The contemporary Asian collection demonstrates the important contributions that Asian artists make to the development of global contemporary art, often by drawing on local concerns and traditional forms, philosophies and techniques. This is evident in key works that reflect significant moments in the twentieth and twenty-first century Avant-garde, including Xu Bing's A book from the sky 1987–91, Nam June Paik's Global groove 1973 and TV Cello 2000, as well as major groups of work by Yayoi Kusama, Lee Ufan and Ai Weiwei. Collection strengths include contemporary Chinese art; contemporary Japanese art; and strong collections of Southeast Asian art. Contemporary Indian art is another area of focus including major works by Atul Dodiya, NS Harsha, Bhupen Khakhar, Bharti Kher, Nalini Malani, Nasreen Mohamedi, Surendran Nair, Pushpamala N, Ravinder Reddy and Vivan Sundaram. While Asian cultures are distinct and diverse, many works in the contemporary Asian collection display recurrent iconography due to long histories of cultural and economic exchange and the sharing of religious beliefs. The lotus, for example, is used as a symbol of purity and transformation in Dinh Q Lê's Lotusland 1999, an exploration of the effects of Agent Orange in Vietnam; is central to Montien Boonma's reflections on the importance of daily Buddhist practice; is at the feet of Ravinder Reddy's monumental sculpture Woman with lotus flower 1998; and is an ornamental motif in Ah Xian's Human human – lotus, cloisonné figure 1 2000–01. 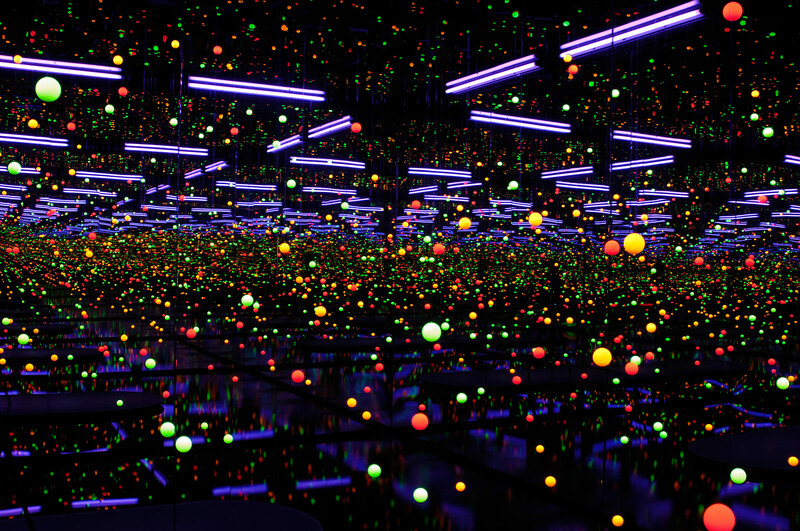 Richly symbolic floral imagery can also be found in Yayoi Kusama's exuberant, oversized sculpture 'Flowers that bloom at midnight' 2011, Khadim Ali's exquisite miniature paintings commenting upon contemporary events in Afghanistan, and in Fang Lijun's 980810 1998, with its reference to Mao Zedong's 'Hundred Flowers Campaign' of the 1950s. Other connections are made through media and techniques, such as those found in ink painting and calligraphy. Dialogues can be established, for instance, between the calligraphic strokes of Lee Ufan's meditations on silence, stillness and space; the broad and often textual brushwork of Irene Chou's metaphysical landscapes; and the superb brush-and-ink painting in Huang Yongyu's Lotus with birds 1984. The explosive gunpowder drawings of Cai Guo-Qiang and the improvisational ink portraits of Tang Da Wu further demonstrate a broad engagement with the philosophies and aesthetics of calligraphy and ink painting. A group of sculptures and installations that celebrate the creative flowering of contemporary porcelain form a growing focus in the contemporary Asian collection. The famous kilns of Jingdezhen, which for centuries produced fine porcelain objects and vessels for the Chinese court, is a point of reference, with works such as Ah Xian's figurative sculptures produced there. The collection also features works that experiment with the versatility of the medium and includes artists from China and its diaspora, Hong Kong, Korea and Vietnam. Video art is another area of increasing strength in this collection. The use of video in China since the 1990s to document performance art is represented in works by He Yunchang, Qiu Zhijie, Song Dong and Zhang Huan, while major video works by Chen Quilin, Dinh Q Lê, Liu Wei, Nalini Malani, Matthew Ngui, Jun Nguyen-Hatsushiba, Donghee Koo, Hiraki Sawa, Yang Fudong and Zhang Peili reflect the strength and innovation of Asian artists in this medium. The Gallery's selection of works from West Asia highlights the strong historical links between this region and the Indian subcontinent, primarily through the art of miniature painting. Inspired by the Mughal, Rajput and Pahari miniature traditions of the sixteenth to nineteenth centuries, many of the works within the collection, such as those by Khadim Ali, Ali Kazim, Aisha Khalid, Mohammed Imran Qureshi and Nusra Latif Qureshi, use the miniature style as a formal basis. Key practitioners in other media are also represented here, including The Atlas Group/Walid Raad, Monir Shahroudy Farmanfarmaian, Shadi Ghadirian, Mona Hatoum, Emily Jacir, Almagul Menlibayeva and Bahar Behbahani, Shirin Neshat, Shirana Shahbazi and Sharif Waked.